Photo: Courtesy of NASA. Although it’s been two and a half years since a group of Harvard astrophysicists discovered a pair of bright “bubbles” in data from the Fermi Gamma-Ray Space Telescope, the origin of these gamma-rays is still not well understood. Last summer, Harvard’s Tracy Slater and I began to think about ways that we could test different scenarios for how the Fermi bubbles may have formed. We found a very different gamma-ray signal, with a possible connection to dark matter. The Fermi bubbles extend tens of thousands of light years north and south of the Galactic Center—the center of the Milky Way—and are likely the consequence of a very active period in the recent history of the galaxy, maybe having to do with the rate of star formation in the inner galaxy or with an eruption from a supermassive black hole. Early in our investigation of the bubbles, we noticed that their spectrum varies a lot with galactic latitude. At high latitudes—far from the Galactic Plane—the spectrum looks much like we would expect and can be easily explained by cosmic-ray electrons interacting with radiation and the galactic magnetic field. Within ten thousand light-years or so of the plane, however, the spectrum looks very different, exhibiting a sharp and bright feature, peaking at a few GeV. No realistic spectrum of cosmic rays could account for this strange signal. 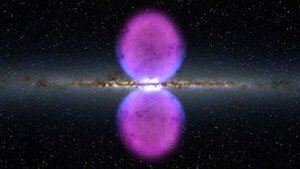 So if not from cosmic rays, where does this extra GeV emission come from? One possibility is that it comes from a large number of rapidly spinning pulsars—too faint to be detected individually, but perhaps collectively bright enough to make up this gamma-ray signal. This interpretation is a bit strained, however, by the degree of isotropy that is exhibited by the gamma-ray background. If enough bright pulsars were present far away from the Galactic Plane to make up the signal from the bubbles, then one would expect the gamma-ray background to be less isotropic than is observed. Those pulsars should lead to a clumpy gamma-ray background instead of the very smooth distribution that Fermi sees. There is another, more exciting, interpretation. If the dark matter is made up of particles that can annihilate with each other, then we should expect those annihilations to produce a sharply peaked spectrum of gamma-rays, very much like the observed from the low-latitude regions of the Fermi bubbles. The angular distribution of the observed gamma-rays is also in good agreement with what we expect from dark matter. Furthermore, the gamma-rays from the inner few degrees around the Galactic Center exhibit the same bump and overall distribution, just as predicted from dark matter annihilations. Are we finally seeing evidence of dark matter particles? According to the old adage, “If it looks like a duck, swims like a duck and quacks like a duck, then it is probably a duck.” The gamma-ray signal we have discovered certainly looks, swims and quacks like dark matter, but more work remains to be done before we can rule out some very dark matter-like imitators.